Gaza. Oakland. What’s the Difference? Four years ago the Israeli Police Unit Yamam took first place in the SWAT team competition held at Urban Shield, a police training conference and weapons show held in Oakland, California. When word of their victory reached Israel it became the subject of a thread on a blog popular with Israeli military and security buffs. I used Google’s translate tool to try to figure out what was said in the conversation. The “Strip” is a reference to Gaza, it appears. Another commenter then suggested, “also quietly add NEWARK PD.” However, they’re probably unfamiliar with the Bay Area’s geography, and confusing Newark, New Jersey, with Newark, California. 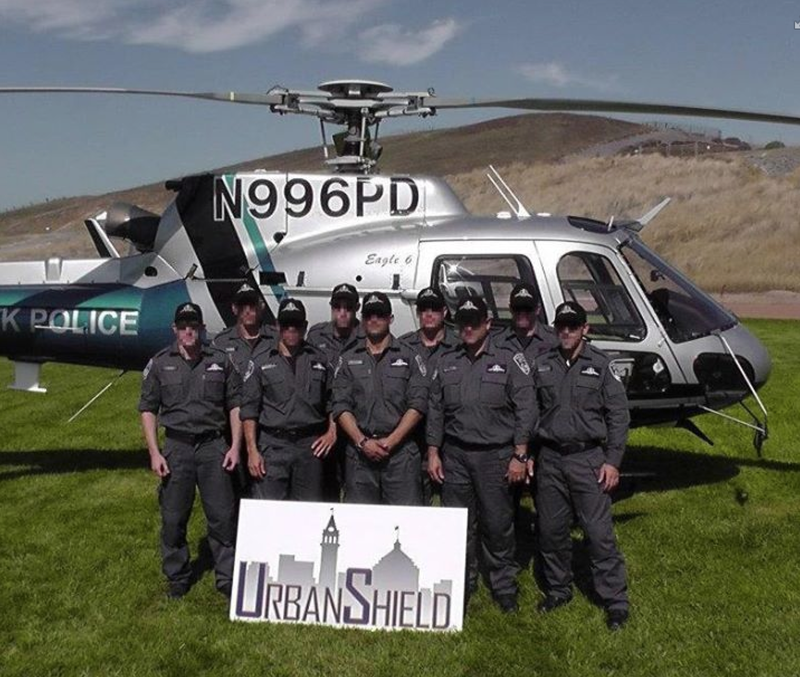 A photo of the Israeli SWAT team that took 1st Place at Alameda County’s Urban Shield competition in 2010. (Source: Israel Police, Facebook page.) The helicopter in the background is one of the two Eagles used by the East Bay Regional Park District Police. Protesters at the Port of Oakland on Saturday, August 16 march to a marine terminal to block an Israeli cargo vessel from docking. 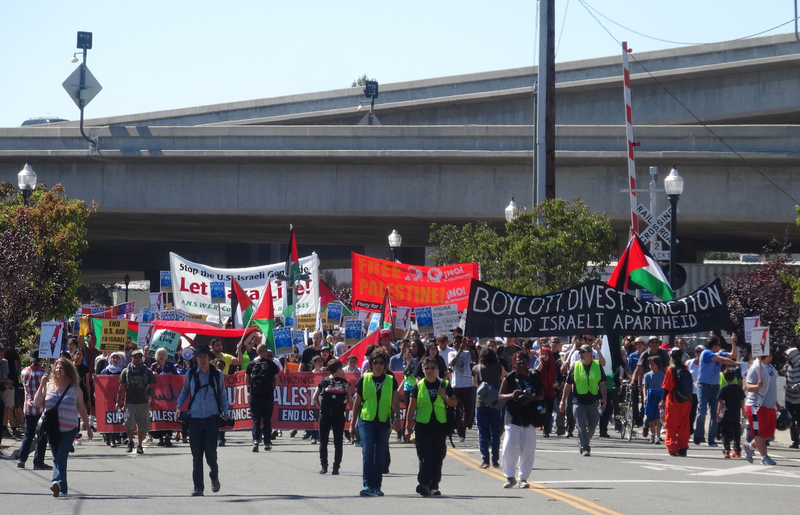 On Saturday between one and two thousand protesters marched on the Port of Oakland to “blockade” one of its busy marine terminals and prevent an Israeli ship from docking. 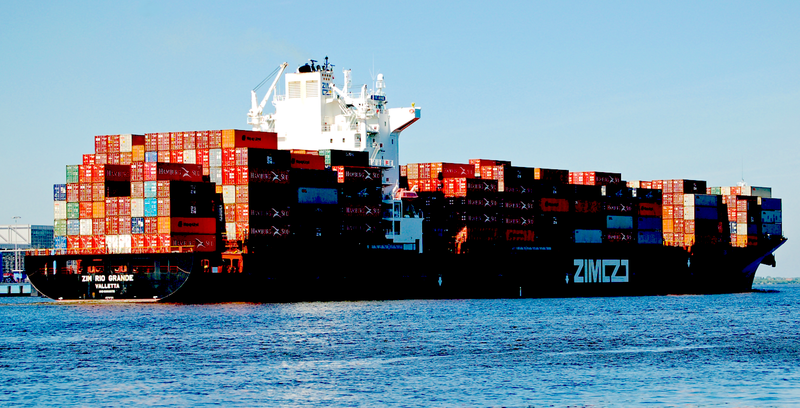 After confronting a line of police guarding the waterfront the protesters declared victory; the Zim Lines cargo was on a vessel that hovered offshore, afraid to dock, they said, and port workers wouldn’t be unloading it. One protester looking beyond the line of police and barbed wire fences separating the people from the port explained that the purpose of the action was to “impede the flow of capital.” Stopping one of Zim’s ships—the company’s vessels arrive in Oakland about four times a month, according to Zim’s web site—was a small, but real economic blow against Israel. Palestinian solidarity activists inside Israel’s biggest economic and military partner, the United States, have worked for years to build a boycott, divest and sanction movement. They’ve asked pension funds and universities to divest from companies that do business with the state of Israel, and they’ve asked academics and musicians to boycott Israel by canceling concerts and shunning conferences. They’ve had some success. California Governor Jerry Brown and Israeli Prime Minister Benjamin Netanyahu sign a memorandum of understanding, March 5, 2014 in Mountain View. But if it’s a matter of stopping the flow of capital, the ports are a relatively small conduit of trade between California and Israel. For over 20 years California’s technology industry has been channeling billions of dollars to finance the growth of Israeli tech firms. The flow of capital between California and Israel is digital, transmitted as currency and intellectual property. And this flow of capital occurs mostly through the decisions of a small number private equity firms and perhaps as few as a dozen large corporations. These flows of capital supporting Israel’s economy are less susceptible to social movement pressure. The amount of support of for Israel’s economy originating from Silicon Valley’s private equity firms is especially large. In 2001, during the first year of the Second Intifada, Sequoia Capital Partners, a private equity firm headquartered in Menlo Park, raised $150 million to invest in Israeli technology companies. This was Sequoia’s second Israel-focused venture capital fund. Last year Sequoia raised its fifth Israel-dedicated fund, totaling $215 million. Since 1999 Sequoia Capital has injected over $789 million into Israel’s software and electronics industries. Much of this money managed by Sequoia Capital was contributed by California investors, including major tax-exempt institutions like the J. Paul Getty Trust, and the Gordon and Betty Moore Foundation, but also from wealthy companies and individuals from San Francisco to San Jose. The offices of Sequoia Capital Partners in Herzliya Pituach, Israel. Accel Venture Partners, another one of the giants of Silicon Valley private equity, set up its first Israel-focused investment vehicle in 2001. Joseph Shoendorf of Accel told the Haaretz newspaper in 2007 that Accel has invested over $200 million in 20 Israeli companies. He added that many of Accel’s investments in Israel are not the run-of-the-mill consumer apps and gadgets that are so popular in the Bay Area’s tech scene. Although Israeli engineers produce plenty of that, Shoendorf said, “the world’s security situation is expected to get worse, and as a result, inventiveness will increase. The armies of the world are seeking solutions to a problem, and will encourage technological answers.” Last March, Accel successfully raised $475 million for a fund that will burn a lot of its powder supporting Israeli tech companies. A lot of California’s venture capital has been exported to Israel to fund military and cybersecurity startups. Israeli society, constantly mobilized for a counter-insurgency war and occupation, creates an environment in which the nation’s hi-tech firms see their main role as contributing to the security of the Jewish state. 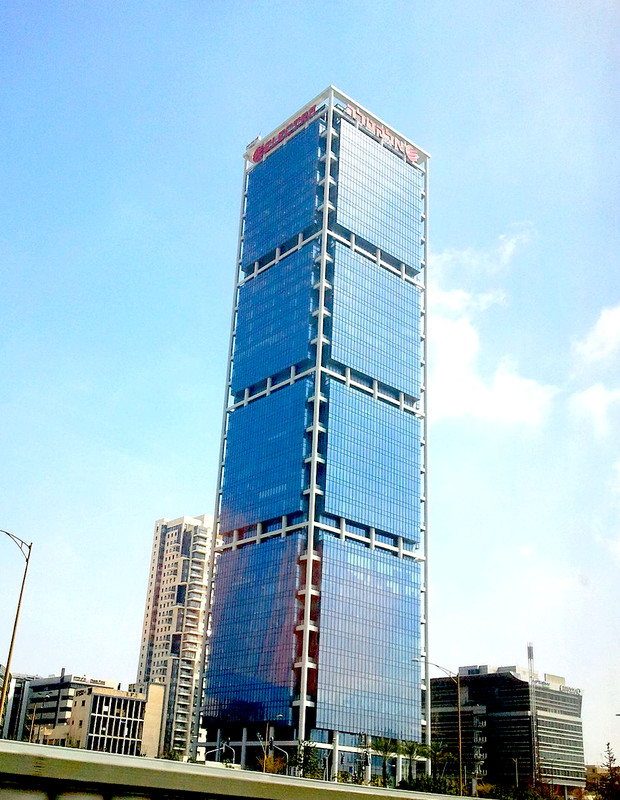 Google rents 8 floors in this Tel Aviv office tower. But the U.S. tech industry is also steeped in surveillance and weapons companies, and even the big consumer and enterprise brands like Google, Microsoft, and Cisco produce militarized software and hardware for use here and abroad. The contributions of Hewlett Packard in creating Israel’s biometric tracking system to control the movements of Palestinians is well known. 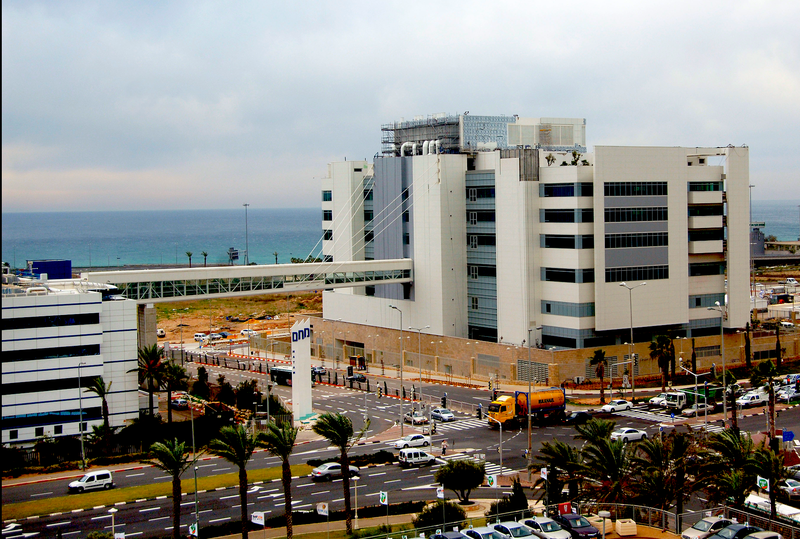 Hewlett Packard also maintains the Israel Defense Ministry’s server farms, a job IBM previously held. What makes the California-Israel economic connection powerful, however, isn’t so much the nature of the technologies being traded, and the capabilities they provide the Israeli state and military, but more so the sheer economic value of these transactions. Foreign direct investment into Israel has risen since 2010, and the United States is the key source of capital for Israeli companies. According to the Organization for Economic Cooperation and Development (OECD) Israel received $1.846 billion from U.S. investors in 2012, a total that has likely risen over the past two years. That’s about two thirds of the total military aid the U.S. government provided Israel the same year. U.S. investors have built up large positions in Israel’s economy, mostly through ownership of stock in Israeli corporations. In 2012 U.S. investors held a $19.7 billion stake in Israel’s economy, more than double the interest owned by all European countries combined. And corporations registered in the Cayman Islands, a tax shelter where thousands of American investors establish offshore funds, owned another $8.6 billion of Israel’s economy. For example, the Sequoia Capital Partners venture firm of Menlo Park raised $215 million last August to invest entirely in Israel. The legal place of incorporation for this fund? The Cayman Islands. California investors own and manage stakes in Israeli companies like Mellanox Technologies, Ltd.. In 2002 Silicon Valley venture capital firms and several U.S. tech companies provided Mellanox with $64 million in funding. The American investors included three Menlo Park private equity firms, Sequoia Venture Partners, U.S. Venture Partners, and Bessemer Venture Partners, as well as technology giants IBM and Intel. Using this capital, Mellanox, headquartered in Yokneam, Israel, grew from a small company into a transnational technology giant valued today at $1.8 billion. It’s a key supplier of hardware to Hewlett Packard, IBM, and Intel. It’s main office in Yokneam looks like any other tech campus you can see in San Mateo County off the 101 Highway, with gleaming glass mid-rise buildings tucked among trees and grass. Yokneam is in the heart of Israel’s Silicon Wadi (wadi being “valley” in Arabic). Prior to 1948 Yokneam was called Qira, the site of a Palestinian village and farms, but the area was “depopulated” and occupied by Israeli forces, and later settled and transformed into one of Israel’s most affluent cities. Lots of Silicon Valley venture capital firms have also set up offices in Israel. The location of choice for California investors seems to be Herzliya Pituach, a posh ocean side district of the city of Herliya. North of Tel Aviv, Herzliya is named after Theodor Herzl, considered by many to be the intellectual father of Zionism. 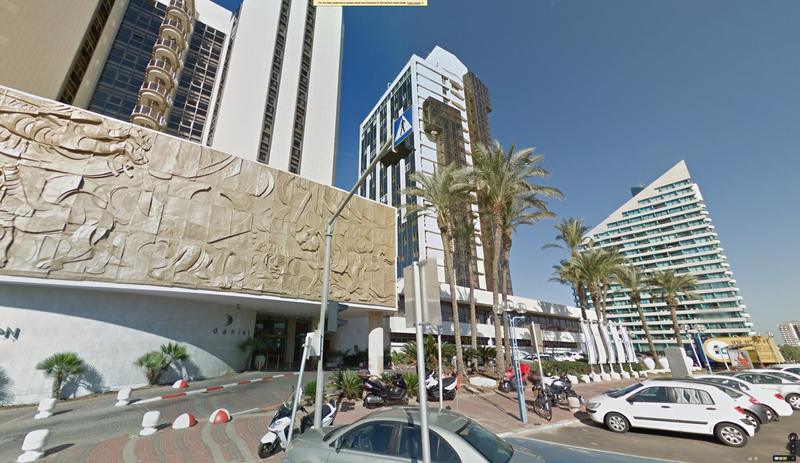 The Herzliya Pituach is one of the wealthiest spots in all of Israel, home to many of the nation’s elite families. Bessemer Venture Partners’ Israel office is located just a few blocks from the Marinali Marina yacht harbor, and a short drive from million dollar beachfront homes. Sequoia Venture Partners maintain an office on Ramat Yam in one of the high rise towers with views of the azure Mediterranean Sea. The business links between Silicon Valley and Israel aren’t apolitical. Many of California’s venture capital investors and technology executives are staunch supporters of pro-Israel causes. They have established numerous nonprofit organizations to strengthen economic and political ties between California and Israel. The California-Israel Chamber of Commerce, located in Cupertino, is funded by Silicon Valley companies, investors and law firms like Intel, Paypal, Silicon Valley Bank, and Morrison Foerster. Executives from these companies sit on the Chamber’s board of directors. Their ties to other pro-Israel political groups are numerous. Operating out of offices on Montgomery Street in downtown San Francisco, across the Street from Israel’s consulate, Israel21C produces media promoting Israel’s technology companies. Recent articles published by the group include “20 top tech inventions born of conflict,” and a profile of the “maverick thinker” behind the creation of Israel’s Iron Dome missile defense system. A recent film produced by the organization promotes Tel Aviv as a startup epicenter similar to San Francisco. The General Consul of Israel in San Francisco, Andy David, is a board member of the California-Israel Chamber, as is the president of Silicon Valley Bank. Nir Merry, another board member of the California-Israel Chamber, was born and partly raised in Israel in the Ma’agan Michael kibbutz. His father worked in a hidden underground ammunition factory making armaments used by Jewish commandoes in the battles that created the state of Israel. In a talk to students at the University of California, Santa Barabara, Merry elaborated on the links between Israel’s technology companies and its military. The California-Israel Chamber of Commerce will be hosting an international business summit in October at the Microsoft Campus in Mountain View where innovation will be among the topics. Silicon Valley’s links to Israel have also been promoted through state legislation and the California Governor’s office. 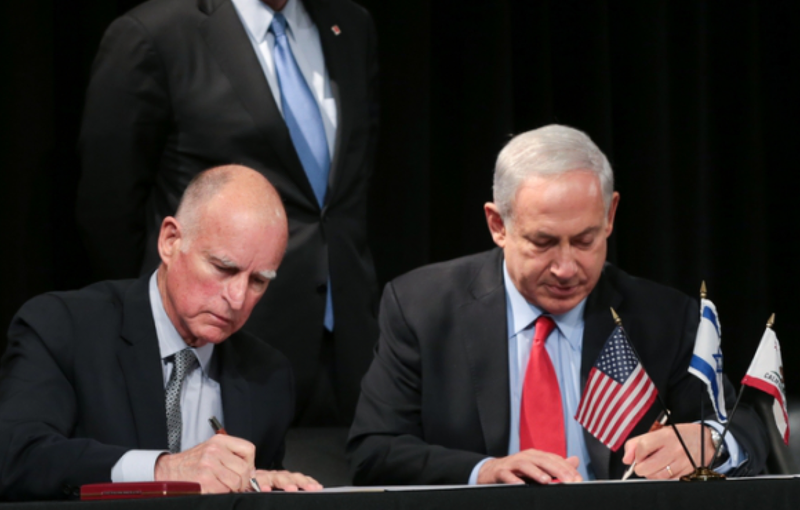 In March of 2014 Governor Jerry Brown signed a memorandum of understanding with Israeli Prime Minister Benjamin Netanyahu promising to promote economic links between California and Israel. The setting for the signing ceremony, Mountain View’s Computer History Museum, underscored the centrality of the tech industry in the agreement. California’s Bay Area is a sprawling megalopolis of more than 7.5 million people. Its overlapping complex of local governments and public authorities collect and spend tens of billions of dollars yearly. Many of the state’s top offices, courts, and regulatory agencies are located here. They decide on important stuff like energy policy and consumer law. And the Bay Area is host to hundreds of major corporations, including the fourth largest bank in the U.S., most of the largest Internet and biotechnology companies, and the ninth largest oil company in the world. What happens in the Bay Area, be it technological advances in computing and medicine, or new laws governing property rights and taxation, influences the direction of not only other states east of us, but in fact the entire world. This place is a global epicenter of change. That means that California’s Bay Area is a political battleground of the highest stakes, and the conflicts here will reverberate around the planet. Labor vs. capital. Immigration. Corporations and the environment. Racial and gender inequalities. Taxes and the social safety net. Policing and surveillance. Public education and its privatization. A lot happens here, and it’s important that the Bay Area’s centers of power be investigated and held accountable. But this just isn’t happening. Unfortunately there’s too few actual journalists in the Bay Area these days to keep track of all the changes, and peel back the layers of government and corporate activity. Sure, everyday there’s a flood of new information on the Internet, and even in print, about the latest government scandal, the big money trying to buy a vote or shape a policy, about the wrongdoing of companies, or disturbing environmental crises that are intensifying around us. Stepping back, however, and taking in the whole offering of journalism written here in the Bay Area, about what’s going on in this place, one can’t help but be disappointed. Contemporary journalism about this place is disjoint, and missing a lot. In particular there’s an absence of deeper investigative work examining changes in the economy, and the new inequalities that are being concretized. Part of the answer is that journalism as an independent profession continues to be hollowed out. Of course the newspapers and magazines of the pre-Internet age were deeply flawed, and the media has never been an oppositional institution. But in prior eras there was a press corps, and for all their flaws and biases the reporters and editors were many in number, enough so that more than a few muckrakers could find institutional bases from which to do work that requires deep digging, perseverance, and a living wage. Plenty of people could make careers by telling stories about abuses of power by wealthy capitalist interests, or the malfeasance of politicians and bureaucrats. Not anymore. And it’s getting worse. Over the next six years the number of reporters and editors employed in California will continue to drop. There’s already only about 4,600 reporters in California. Many of them work for trade publications, or they write about art, film, music, food. Those are worthy and interesting subjects, but without politics a newspaper becomes Sunset Magazine. Without political content a media outlet is entertainment. It no longer serves a public purpose. Who knows what the actual number is of reporters who are trying to investigate and write about society and politics with a critical eye to power? It’s probably a fraction of 4,600. Working in the public relations industry is much more lucrative than being a reporter or editor. Source: California Employment Development Department. What’s really disturbing is that the overall number of people employed in the media industry in California is growing, but these jobs are focused on producing entertainment and advertisements. But worst of all is where all the former journalists are heading: the public relations industry. Again, there’s only about 4,600 actual reporters in California, and the number focused on politics is much smaller, but the state’s public relations industry has over 23,000 jobs. These are full time jobs crafting stories that valorize powerful interests. These are jobs at the big banks, the big oil companies, and inside the halls of government. These are jobs with the boutique PR firms of the Bay Area that are hired at exorbitant rates by companies and governments to handle crises, or to produce slick PR campaigns. These are jobs producing phoney news web sites that tow the line of corporate giants. What does it say about our society that for every reporter there are five or more PR specialists out there putting their spin on information? According to the state’s Economic Development Department, between 2010 and 2020 the public relations industry in California will add 5,000 more “specialist” jobs. That’s 5,000 more full time spinners managing the flow and content of information about governments and corporations. 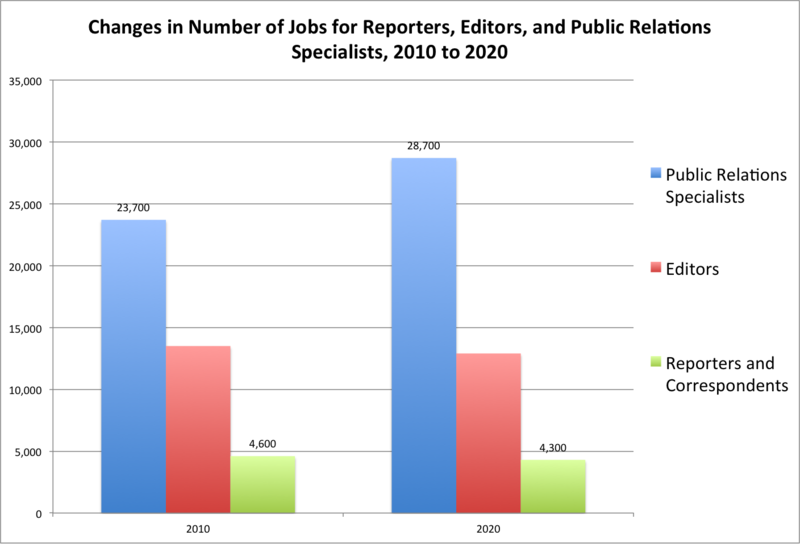 That’s 5,000 additional PR jobs, more jobs added in the PR industry than there are total reporter jobs existing. Meanwhile the number of jobs for reporters, for those who are trying to eke out a somewhat independent role digging up information and telling stories about power and politics, are projected to continue slowly declining.